SA'DAY NOIGHT, 'Ighlite of the week saw Slade bill toppin' at da Rainbow. And the jobsworths who had been doing such a fine job prior to the band's appearance gave up as soon as the Wolverhampton Ravers took to the stage. A standing ovation before the band went on -- thousands storming the stage before the first number -- a humid, sweaty atmosphere and Slade had it made. A gent to my left was heard to remark "they are going to be bigger than T. Rex" and no one in the vicinity ventured to disagree. Certainly those dancing in the aisles weren't about to. And anyway, it's girls who go to see T. Rex, whereas Slade pull in both the fellers and the birds. Average age sixteen, I'd say -- all with the same idea in mind: to have a damn good time. "Let me hear you making some noise" Holder the lead singer yells after the band have finished their opening number "Hear Me Callin' " and the band go straight into "In Like A Shot" from the "Slade Alive" album. "Anybody fancy a piss? cause I do," Nod yells as the place erupts. Quieter numbers like John Sebastian's "Darling Be Home Soon" were prefaced with "ain't it romantic, don't it get ya at it?" And we're all invited to sway together a la cup final and sing "You'll Never Walk Alone". "Right, let's see some action and noise" Holder says, looking decidedly evil and immediately follows it up and good old rockin'. " Good Golly Miss Molly", where we are treated to the sight of wiggling bums from Dave and Jimmy. Holder certainly has a fine voice ideally suited to any ravin' number and this one was tailor-made for them. Yet they didn't play it straight but interrupted with their famous 'yeah' chants. "Right. I want all the fellers singing 'Yeah, yeah, yeah, yeah'." And obediently they sing. "Yeah, pretty good -- now grab hold of yourselves and we'll do it again." Cheers and the fellers go through their paces again. Jimmy Lea is featured on "Coz I Luv You"
"Like his new suit do you?" we're asked, and Dave Hill is introduced as "Freddy Sparkle" when they start "Take Me Bak' Ome." "If you're all good, he's got his pink frilly knickers on -- and if you're really good he'll drop his trousers," Holder says. Cheers all round as everyone rocks along . The final number "Get Down And Get With It" saw the famous boot dance in evidence as the Rainbow's foundations took a good beating. The encore was preceded with Nod congratulating the audience and suggesting they give themselves a cheer. Involvement all the way. 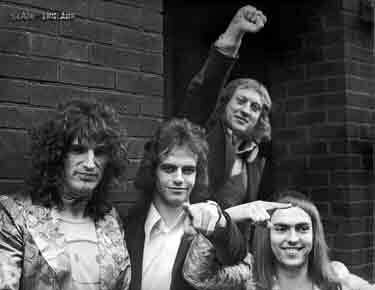 Slade, as musicians, are good -- although they may not win any awards. But at getting their audiences stomping, clapping, swaying and in any way involved, they are leaders. Those who went to see them could in no way have cause for complaint. A good rockin' evening was had by all. And isn't that what it's all about?